A few months ago I was at a quilt meeting, and there were a couple of lovely ladies selling goodies from their crafting rooms… clearing their stash. 🙂 How they managed that I don’t know. 🙂 Jess and I bought some fabric and other goodies at bargain prices, and at the end of the meeting they gave me a big bag of the oddest bits and pieces of wool. Fascinating, interesting, all sorts of different colours and fun yarns with bobbles and nobbles and thread strands. Felicity sent me the pattern… and photos, and I knew exactly what we could do with the big bag of odd bits and pieces of wool. 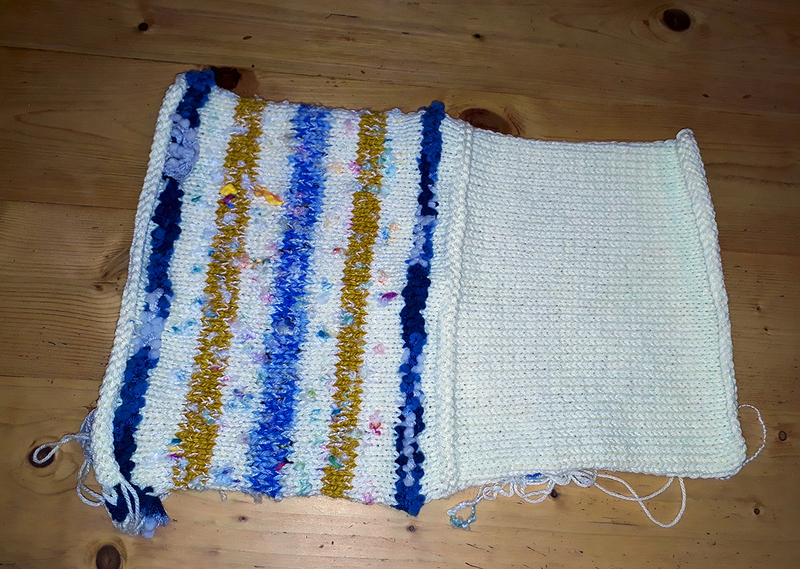 I’ve made up a pattern as I’ve knitted… which is basically a combination of all the patterns, in my own understanding of knitting phraseology… so please let me know of any corrections or changes. Many have expressed interest in participating, thank-you for your support. Please email mands@womanofworth.co.za if you would like to help and join our Heart to Heart group, or please leave a comment below. 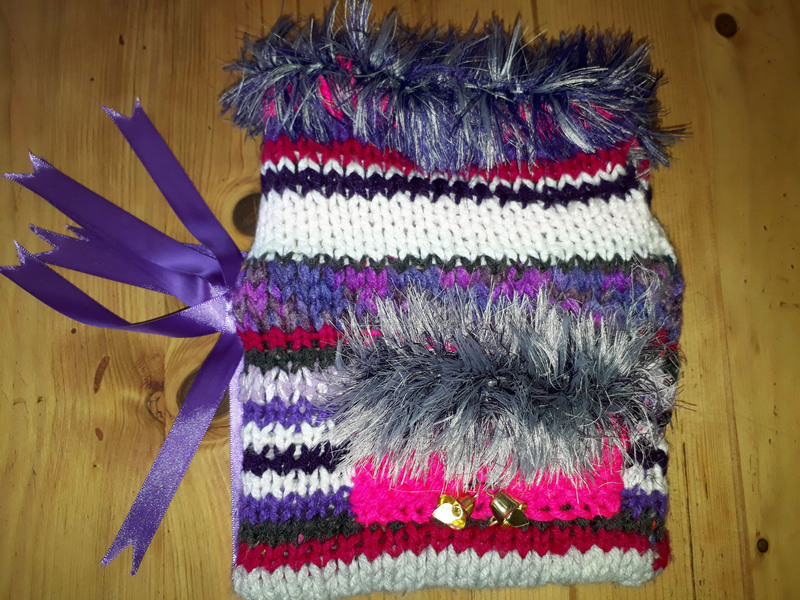 A TwiddleMuff is a double thickness hand muff with bits and pieces attached inside and out. 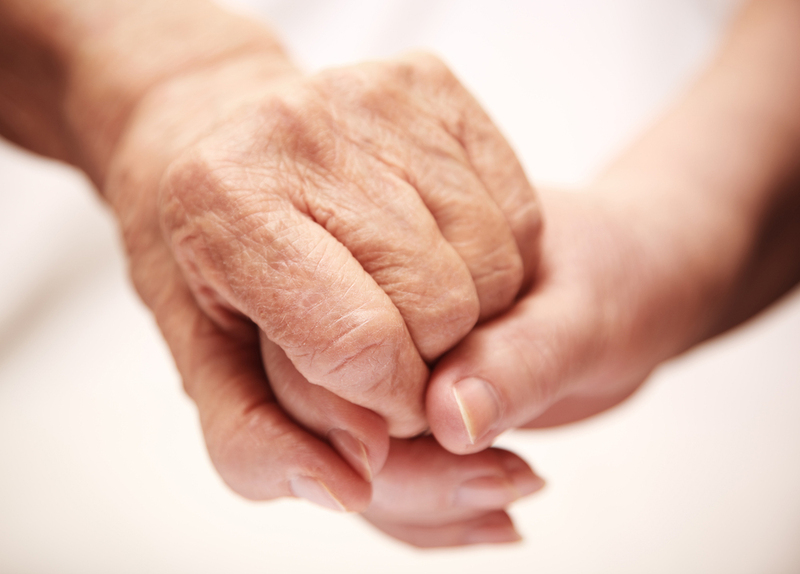 It is designed to provide a stimulation activity for restless hands for patients suffering from Dementia or Alzheimer’s. 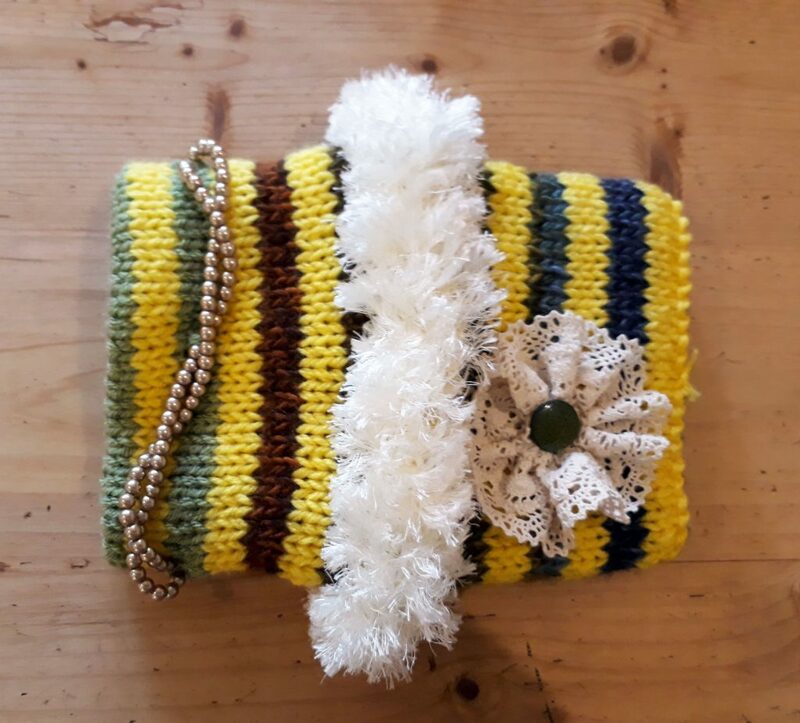 (My mom absolutely loves the TwiddleMuff I’m making so even just people who suffer with really cold hands will enjoy a TwiddleMuff). This pattern is perfect for using up left over and odd balls of wool. Needles: 8mm circular or 6.5mm straight needles. Muff Cuff: Cast on 45 stitches using 2 strands of double knitting wool or 1 strand of chunky wool (one plain colour works best). Work in stocking stitch (knit a row, purl a row) for 27cm. Muff Body: Continue with stocking stitch, but use up oddments of various textures of wool such as chunky, mohair, ribbon etc. until the work measures 60cm (two strands of double knit for two rows each gives a lovely assortment of colours). Finishing: If working with straight needles, lightly iron the long strip, then neatly join the sides together using edge to edge stitch (with the knit side facing out). Turn inside out and push the one-colour cuff up inside the muff body. Sew the two ends together, again using a neat edge to edge stitch. Decoration Now is the time if you want to decorate the muff, inside and out, with ribbons, beads, flowers, zips, loops, pompoms, buttons, etc. 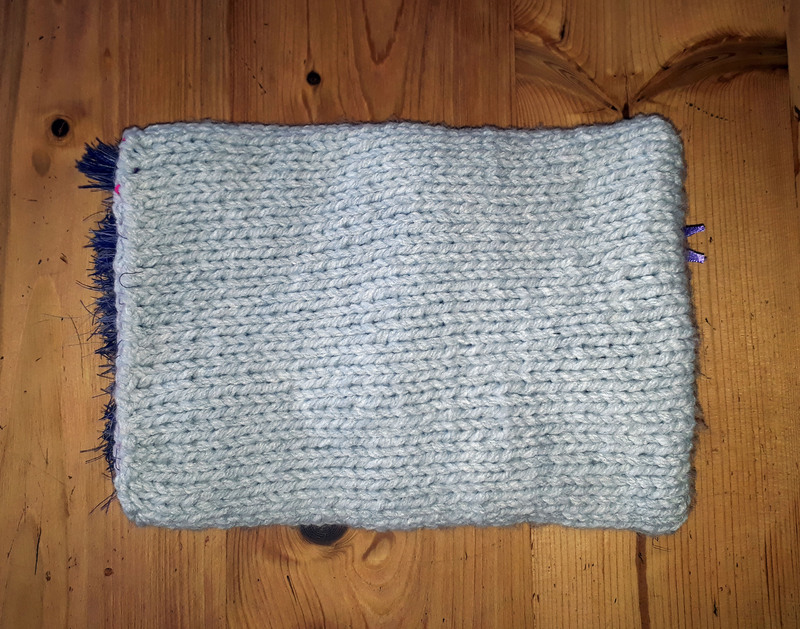 Knit a separate pocket for a favourite photo or a hanky. Be creative, but make sure each item is securely attached. 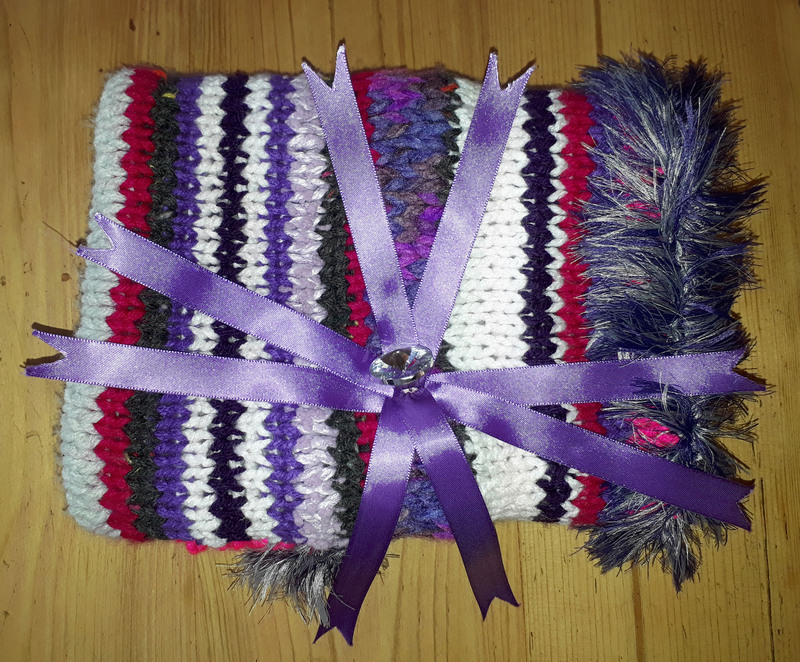 The TwiddleMuffs below have been knitted by Marje and are available for anyone to see.